Other Ingredients: dibasic calcium phosphate, microcrystalline cellulose, stearic acid, and magnesium stearate. Suitable for vegetarians. Suggested Use: For best results, take 1 tablet with a vitamin supplement 30 to 60 minutes before meals. Do not exceed 2 tablets daily. Bioperine provides leverage in digestion, cancer, and a host of other complaints. 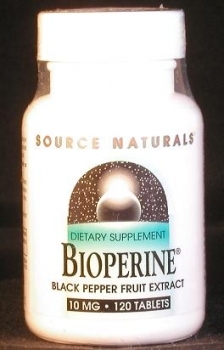 Bioperine® is an extract from the fruits of the black pepper plant. It has a very high content of piperine — the spicy substance that accounts for pepper’s popularity. Black pepper extract has been used extensively in Ayurvedic medicine to treat fevers, digestive disorders, urinary difficulties; rheumatism, neuralgia, and boils. Recent scientific studies have shown that piperine can greatly increase the bioavailability of many other compounds — such as vitamins, minerals, drugs, and herbal substances. It is now widely used to enhance the absorption and effectiveness of nutritional supplements. This supplement is usually used at a dose of 5-10 mg.
Bioperine is a standardized extract from the fruits of black pepper (Piper nigrum) or long pepper (Piper longum). Its piperine content is 95% or more, compared to only 3-9% found in raw forms of these peppers. Recent scientific studies have shown that piperine can greatly increase the bioavailability of many other compounds — such as vitamins, minerals, drugs, and herbal substances. For example, in humans the bioavailability of curcumin was increased by a factor of 20 when used with piperine. Piperine improves the absorption of these compounds in the intestine, promotes their retention in cells, and prevents their being metabolized in the liver. Piperine has also shown promise as an agent for preventing diarrhea, gastric ulcers, stimulating digestive enzymes, suppressing the induction and spread of lung cancer, preventing epileptic convulsions, and stimulating melanin production. This supplement is usually used at 5-10 mg/dose. It is rapidly absorbed and its effects on bioavailability of other compounds lasts 1-2 hours. Doses higher than 10 mg require careful consideration of potential drug interactions.